Ananka's Diary: What IS It? One guess per person. No cheating! It's a SHOE. I'm impressed that so many of you knew what it was! It looks like a really awesome shoe. I keep looking at it, but all I can come up with is a spork, which makes no sense at all. Modern art décor? I really really really want that shoe. something supr cool.......modern art that i will soon create and was obtained by time machine!!! oh...and its made of green leather, cardboard, or tinted aerogel. Looks like its that strapless flip flop. it looks like a spoon or a very thin bendy peice of candy. Is it a chair and a table? 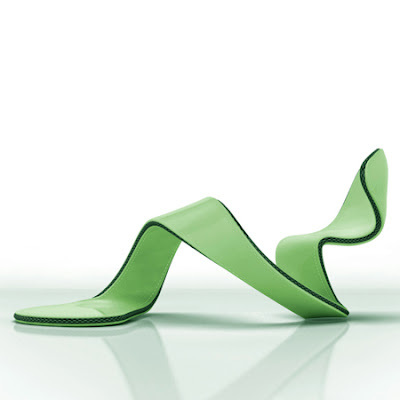 looks like a strange green leather shoe. ummm i think its a relly super cool shue! i love it! if i saw it in stores i would totally get it! umm...some sort of modern art? That the AMAZING you will tell us about in the next post? Art you can sit on (sculpture and sofa at the same time). Is it a some sort of chair? Patent leather, like what shoes are made of. idk if i accidently deleted my comment cuz im just awfull with computers but if i did then i think this is a super amazing shue! i want it! I would say some sort of alien weapon, but I'm going to have to go with shoe. a sugar ribbon- like something they use on food network cake challenges........ok, bad guess. but that's the best i've got. what is it kirsten? Some sort of couch maybe? I think that it is a multi-purpose thingamajig. I know that doesn't sound like a guess but it could be one of those things that you use to hold books open, a bookmark, a massager thingy, or maybe a piece of modern art. But my official guess will be keep-your-book-open tool! 2. His clothes were not tattered or dirty. His shoes were not worn out either. 3. He had large tattoos spiraling up his his arms, and you have to have a fair amount of money to get tattoos like that! *Everyone, please tell me what you think of my observations! Please, remember: I was rather bored that day and I had a cold! OH MY LORD THAT SHOE LOOKS LIKE BENEVOLENT ALIENS LEFT IT FOR US EARTHLINGS TO FIND!! !and wear. I'm guessing you're not going to be telling us anytime soon, r u? I say you report that dude. He's fake begging for money. To make people feel poor and pitiless for him. Either that or he just got homeless. I'd say these three choices. It's a funny looking pooper scooper (which won't do a very good job if its a slushy poo) and has magnets in it to hang up on the fridge for easy accesss! Frances: Maybe the dude was an actor trying to fit into a new role or someone doing a survey on kindness/charity but failed to adequately disguise himself into the role (as seen by your eye for detail and observations :D )? A shoe... I knew that!! i would totally where that shoe! i think this can be a kiki´s draw: the tuneis of Cidade das Sombras. i´m brasilian, minas gerais, belo horizonte, and my name´s Thaís. my friends here don´t know this book, i was question they. so is the best book i did read IN MY LIFE!! the story is so criative. when launch the kiki strike 2 in portuguese i will pay what be nessessaire to read!! so, Kristen, I´M your fan number one!! i love kiki strike, understand? you know that books anybody can leave after start read they??!! kiki strike is so special to me! when a person question me: "whats your favorite book? ", i answer pround: "kiki strike!" i write poems, and when i launch my book, i will devote it to you!! you have a big talent, don´t desperdice it! Right away, I could tell it was a shoe! It's very creative, huh?